Tomorrow, Tuesday, May 25, MILLION DOLLAR QUARTET’s Levi Kreis, a Tony nominee for Best Featured Actor in a Musical, will be a live guest on WNBC’s “LX New York” between 5-6PM on channel 4. The Outer Critics Circle Award Winners were announced today. The awards ceremony will take place on May 27, 2010. FENCES won Outstanding Revival of a Play, Outstanding Actor in a Play (Denzel Washington) and Outstanding Actress in a Play (Viola Davis). LA CAGE AUX FOLLES won Outstanding Revival of a Musical, Outstanding Actor in a Musical (Douglas Hodge), Outstanding Director of a Musical (Terry Johnson) and Outstanding Costume Design (Matthew Wright). LEND ME A TENOR won the Outstanding Featured Actress in a Play Award (Jan Maxwell). A LITTLE NIGHT MUSIC won Outstanding Actress in a Musical (Catherine Zeta-Jones). 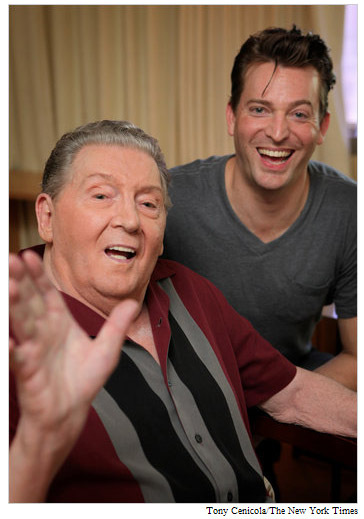 MILLION DOLLAR QUARTET has won Outstanding Featured Actor in a Musical (Levi Kreis). NEXT FALL playwright Geoffrey Nauffts has won the John Gassner Award. THE ORPHANS’ HOME CYCLE won Outstanding Off-Broadway Play and Outstanding Director of a Play (Michael Wilson). RED won Outstanding Broadway Play. WISHFUL DRINKING has won Outstanding Solo Performance (Carrie Fisher). On December 4, 1956, an auspicious twist of fate brought Johnny Cash, Jerry Lee Lewis, Carl Perkins, and Elvis Presley together. The place was Sun Records’ storefront studio in Memphis. The man who made it happen was Sam Phillips, the “Father of Rock and Roll,” who discovered them all. The four young musicians united for the only time in their careers for an impromptu recording that has come to be known as one of the greatest rock jam sessions of all time. Inspired by the actual event, MILLION DOLLAR QUARTET features a treasure trove of the greatest rock and roll, gospel, R&B and country hits from these musicians, including such iconic songs as “Blue Suede Shoes,” “Fever,” “Sixteen Tons,” “Who Do You Love?,” “Great Balls of Fire,” “Riders in the Sky,” “I Walk the Line,” “Folsom Prison Blues,” and “Whole Lotta Shakin’ Goin’ On.” MILLION DOLLAR QUARTET captures the infectious spirit, freewheeling excitement and thrilling sounds of a singular moment when four of the music industry’s most extraordinary talents, all in their creative prime, came together for one of the most memorable nights in music history. Nominations for the 76th annual Drama League Awards, celebrating excellence in Broadway and Off-Broadway theatre, were announced this morning. AS YOU LIKE IT has been nominated for Distinguished Revival of a Play. A BEHANDING IN SPOKANE has been nominated for Distinguished Production of a Play, and Distinguished Performance (Christopher Walken). BRIGHTON BEACH MEMOIRS has been nominated for Distinguished Revival of a Play. COLLECTED STORIES has been nominated for Distinguished Revival of a Play and Distinguished Performance (Linda Lavin). FENCES has been nominated for Distinguished Revival of a Play and two Distinguished Performance Awards (Denzel Washington and Viola Davis). In addition, director Kenny Leon will be honored with the Julia Hansen Award for Excellence in Directing. THE GLASS MENAGERIE has been nominated for the Distinguished Performance Award (Judith Ivey). HAMLET has been nominated for the Distinguished Performance Award (Jude Law). LA CAGE AUX FOLLES has been nominated for Distinguished Revival of a Musical and two Distinguished Performance Awards (Kelsey Grammer and Douglas Hodge). LEND ME A TENOR has been nominated for Distinguished Revival of a Play and two Distinguished Performance Awards (Jan Maxwell and Tony Shalhoub). A LITTLE NIGHT MUSIC has been nominated for Distinguished Revival of a Musical and two Distinguished Performance Awards (Angela Lansbury and Catherine Zeta-Jones). LOOPED has been nominated for the Distinguished Performance Award (Valerie Harper). MILLION DOLLAR QUARTET has been nominated for Distinguished Production of a Musical and two Distinguished Performance Awards (Lance Guest and Levi Kreis). NEXT FALL has been nominated for Distinguished Production of a Play. PRESENT LAUGHTER has been nominated for the Distinguished Performance Award (Victor Garber). RAGTIME has been nominated for Distinguished Revival of a Musical and Distinguished Performance (Bobby Steggert). RED has been nominated for Distinguished Production of a Play and two Distinguished Performance Awards (Alfred Molina and Eddie Redmayne). THE ROYAL FAMILY has been nominated for the Distinguished Performance Award (Jan Maxwell). In addition, Rosemary Harris, a previous Distinguished Performance Award winner, will be recognized at the ceremony. SONDHEIM ON SONDHEIM has been nominated for Distinguished Production of a Musical and two Distinguished Performance Awards (Barbara Cook and Vanessa Williams). TIME STANDS STILL has been nominated for the Distinguished Performance Award (Laura Linney). THE UNDERSTUDY has been nominated for the Distinguished Performance Award (Mark-Paul Gosselaar). A VIEW FROM THE BRIDGE has been nominated for Distinguished Revival of a Play and two Distinguished Performance Awards (Scarlett Johansson and Jessica Hecht). WISHFUL DRINKING has been nominated for the Distinguished Performance Award (Carrie Fisher). ATLANTIC THEATER COMPANY has been honored with a nomination for Stephen Rea, a past recipient of the Distinguished Performance Award who will be honored on the dais for his work this season in AGES OF THE MOON. MANHATTAN THEATRE CLUB productions have been honored with four Drama League nominations: two nominations for COLLECTED STORIES, one nomination for THE ROYAL FAMILY and one nomination for TIME STANDS STILL. ROUNDABOUT THEATRE COMPANY productions have been honored with seven nominations including three for SONDHEIM ON SONDHEIM, one for THE GLASS MENAGERIE, one for PRESENT LAUGHTER, one for THE UNDERSTUDY and one for WISHFUL DRINKING.